The NABC named Washington the Division I team of the week while the U.S. Basketball Writers handed out another accolade to forward Noah Dickerson. The National Association of Basketball Coaches (NABC) Tuesday named Washington its Division I Team of the Week, while the U.S. Basketball Writers Association (USBWA) selected forward Noah Dickerson as national player of the week. The accolades follow the Huskies’ victories over No. 25 Arizona State and No. 9 Arizona last week, their first consecutive wins over ranked opponents since 2007. Washington (17-6, 7-3) scored a 68-64 win over the Sun Devils as Dickerson tallied 21 points and added 16 rebounds. Freshman Jaylen Nowell contributed 15 points and a career-high-tying nine rebounds. 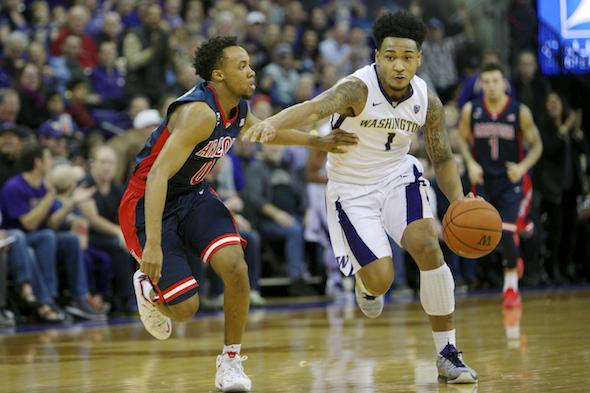 Washington followed with a buzzer-beater win over the Wildcats. With the game tied at 75, Arizona blocked Nowell’s shot in the lane directly into the hands of UW junior Dominic Green, whose three-pointer gave Washington a 78-75 victory. Dickerson scored 25 points and had seven rebounds while David Crisp added 16 and Nowell and Green each had 14. Monday, Dickerson was selected NCAA Player of the Week and Pac-12 Player of the Week. Dickerson is Washington’s second-leading scorer at 15 points per game and its leading rebounder at 8.1. Washington, which has three wins over ranked opponents this season, including two over Associated Press top-10 teams (Kansas, Arizona), face the Oregon Ducks Thursday at 7 p.m. in Eugene (FS1). The Huskies play at Oregon State at 7 p.m. Saturday (ESPNU).